800 Maple has been serving fine food and a steady stream of regular customers at their Williamsville location for almost 10 years. Chef Charlie Mallia has been doing the heavy lifting since the beginning. 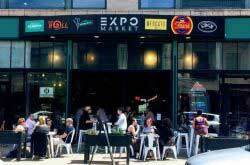 It is owned by a group that includes Henry Gorino (former owner of Oliver’s), Chuck Mauro and John Tronolone who also own Siena on Main in Snyder. 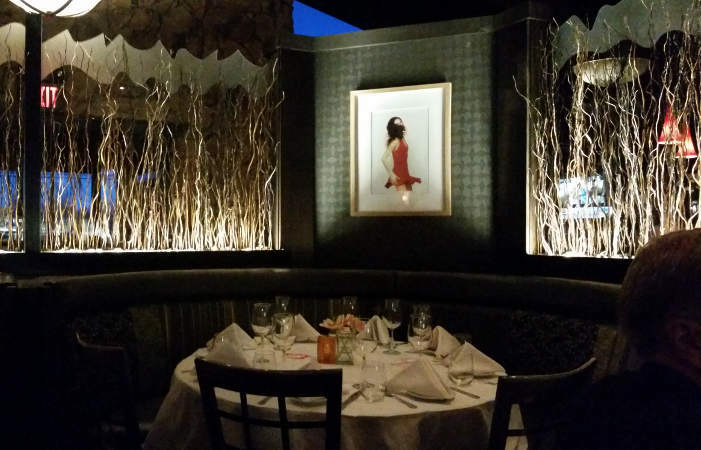 While the decor is modern metro (remodeled last year) the cuisine is a cross between steak house and Italian. Attire is mostly upscale suburban with maybe a third of the men wearing jackets. The clientele appeared to be a mix of young professional and middle-aged locals. It has long been regarded as one of the best dining options in Williamsville and never shy with their pricing. 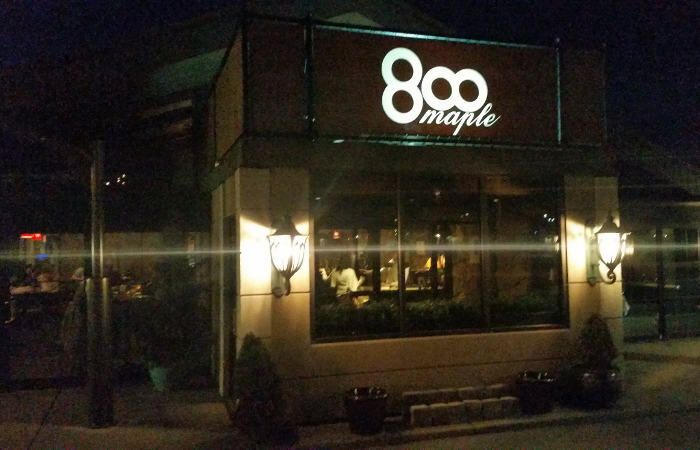 The food and service at 800 Maple are consistently good and the traffic consistently strong. Sure and steady is the program here where customers know what to expect and come back often. While dishes stick mostly to the tried and true the kitchen shows plenty of creative flair in subtle ways. Steak, seafood and house-made pasta are all top notch and priced accordingly. 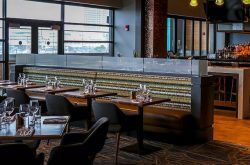 The menu is an eclectic list covering American (steak, pork chops, roasted chicken, duck breast, burgers, rack of lamb) and Italian classics (Short Ribs with a Parmesan Risotto, Oxtail Bolognese, Cavatelli -house made pasta, braised chicken, sweet peas, carrots, pancetta & mascarpone). 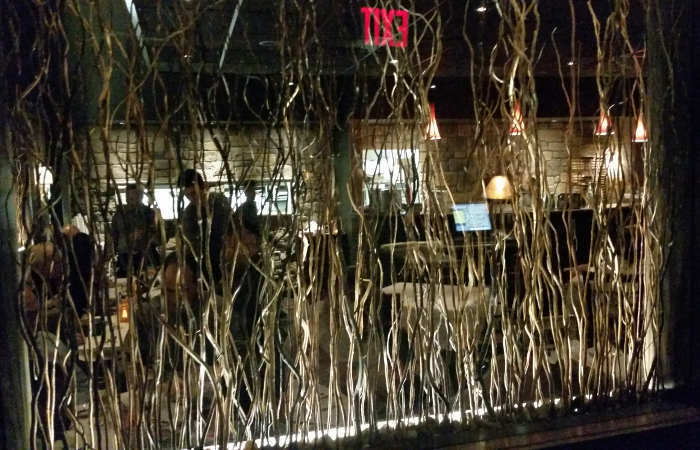 Their wood fired grill cranks out a long list of artisan pizzas ($15). I counted nine options on the menu, and while we didn’t sample any they sure looked good. I’d say the theme of the menu is less geographic and more “give the customer what they want”. 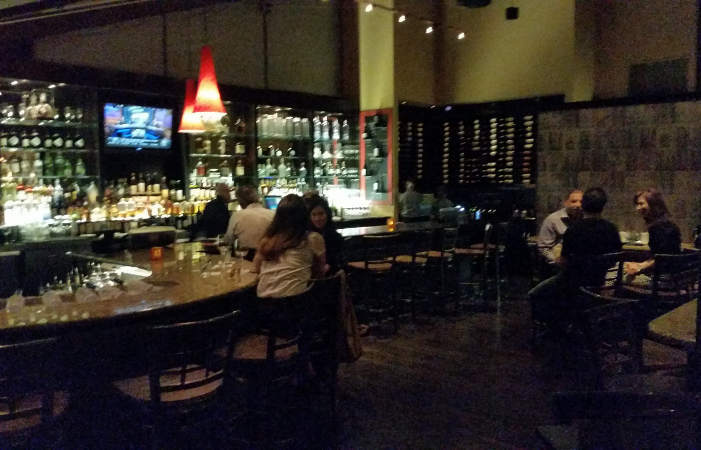 Their steak section covers the bases and ranges in price from $30 – $42. You can add a lobster tail to any for an additioanl $42. They have a healthy wine list with some nice options, roughly 20 in white and about 40 red, that reflects their international menu and bold pricing structure. We opted for the Petite Syrah, Foppiano 2010, Russian River Valley – $35. An excellent choice if I do say so myself. They also serve Sunday Brunch with a “Build your own Bloodys” option served 10am-2pm. A daily special – burgers on Monday, Lobster night on Friday etc. is standard. 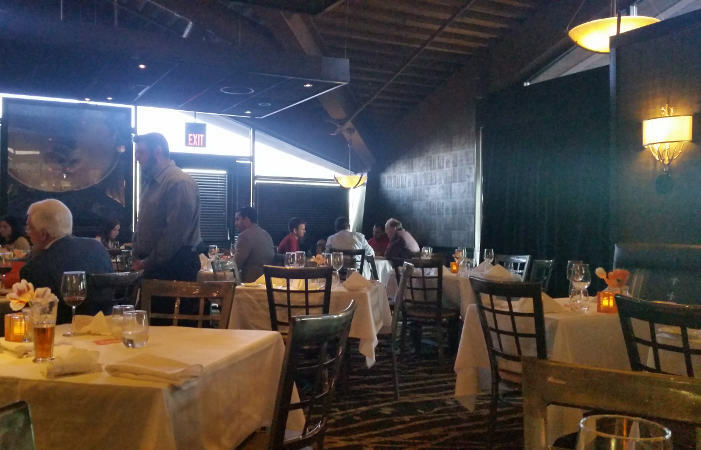 We stopped in on a busy Thursday evening that saw every table occupied at one time or another. The bar was active but not crowded. The chic modern decor is punctuated by a woodsy theme with a semi-transparent glass/forest wall separating the bar/entry/dining room. The theme is carried forward in the dining room carpeting and light fixtures. Dark colors highlighted by golds and tans. 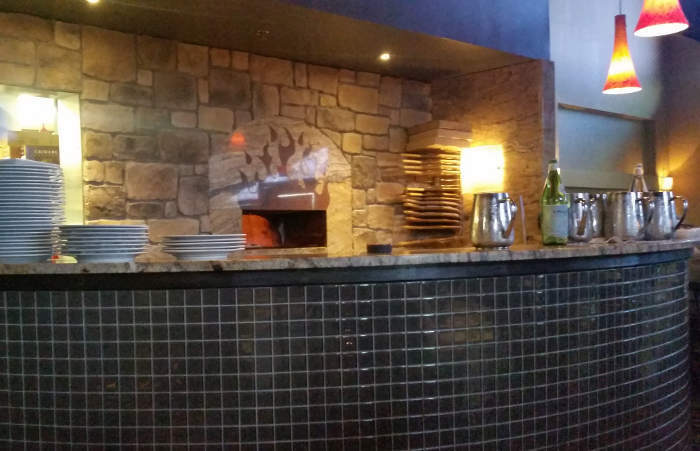 The main dining area is centered by the wood burning brick oven with glossy tile. 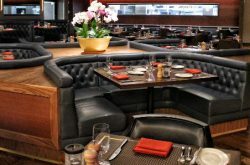 Tall cathedral ceilings, the trademark of the Four Seasons chain restaurant that once occupied the building, are tempered by hanging platforms in black. The chairs are metal and wood, the tables covered in white cloth and paper. We were seated, ordered drinks and had bread on the table in a blink of an eye. 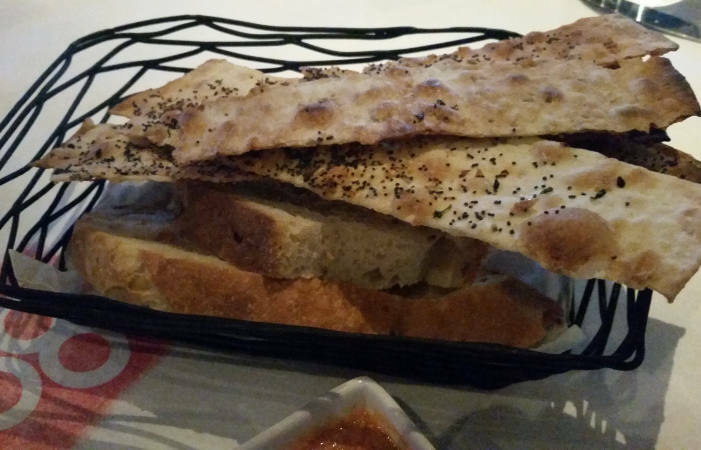 The bread basket came with a lovely roasted red pepper artichoke tapenade, and flat bread crisps made in-house and baked in the pizza oven. I went with a Sam Adams Lager, my companion the French Pear Tini ($9.50). The beer list is average with about 20 by the bottle. In addition to Sam they had Blue Moon, a Flying Bison and a Southern Tier. 800 is well regarded for their cocktails and the French Pear Tini was not a disappointment. 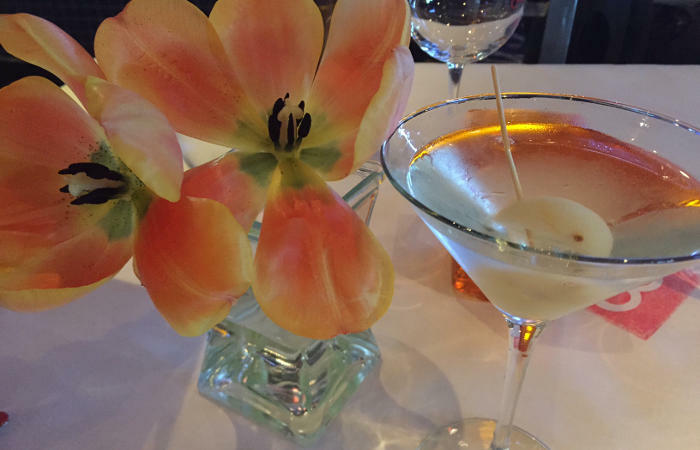 Grey Goose La Poire vodka and St. Germaine liqueur, shaken cold with a baby pear, a well crafted martini with a hint of pear flavor and not too sweet. 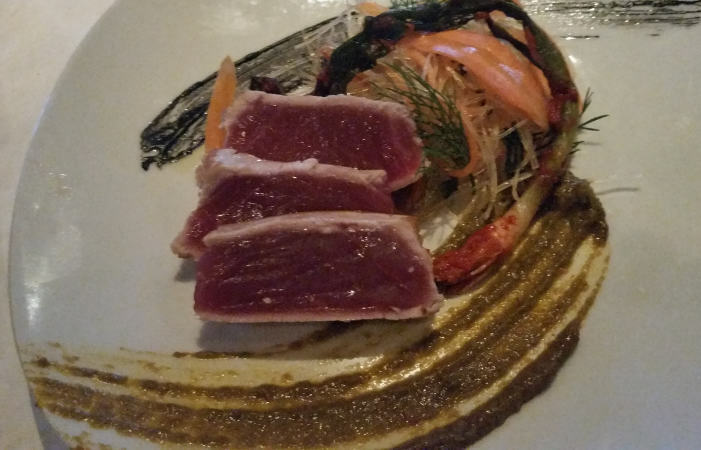 Seared Ahi Tuna -served with Glass noodles, kimchi puree, carrot slices and a splash of squid ink -$14.95. While there was a lot going on visually with this dish the flavors were perfectly understated. The tuna was wonderfully simple and the kimchi puree a perfect compliment. The al dente chewy glass noodles and carrots form a bit of a side salad. This was the most interesting dish of the night. 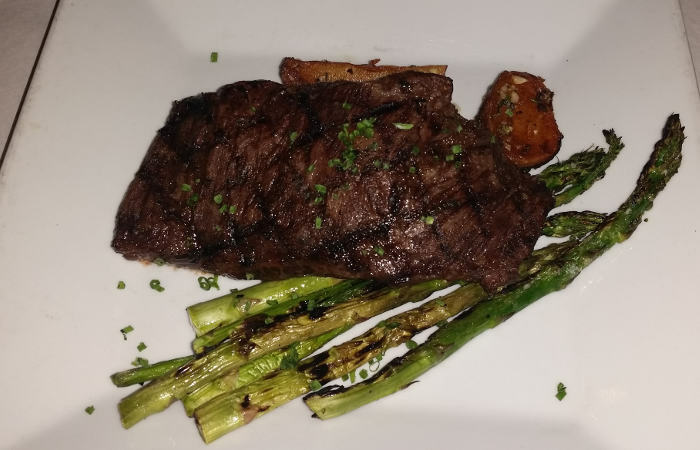 Wood grilled Prime Skirt Steak – $30. The steaks come with a trio of house made steak sauces which were absolutely unnecessary as this was perfect on its own. This cut should be a staple in every dining room. It was perfectly cooked to a medium rare, nicely seasoned and just oozing in flavor. The steak was accompanied by some roasted asparagus and potatoes with garlic that were great. 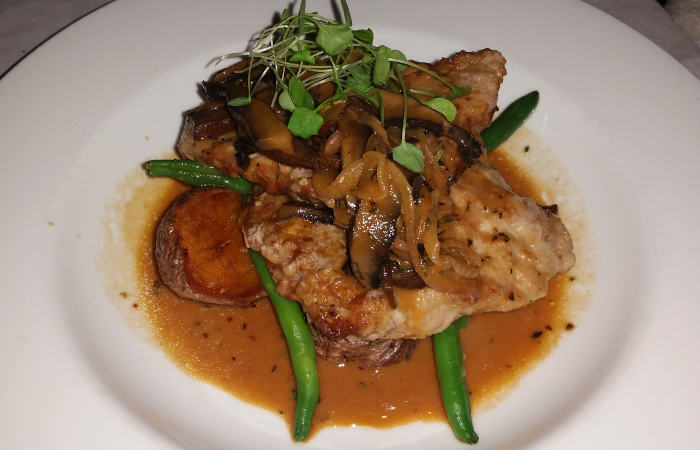 Veal Marsala – lightly floured and sautéed with portabella mushrooms, and Marsala wine sauce – $34.95. This was a special for the night and while not cheap it was one of the best Veal Marsala dishes I’ve encountered. Two large hardy pieces of fork tender veal with a refreshingly light sauce yet full wine flavored with a hint of herb. 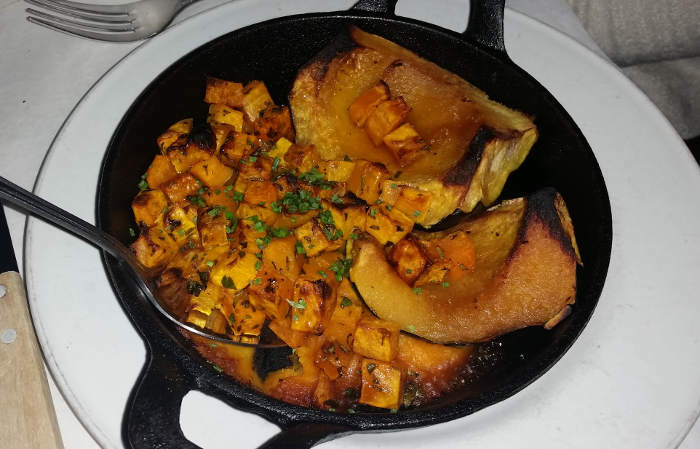 Hearth Roasted Squash with chestnut honey – $7.95. We also ordered a side to share – two wedges of acorn squash, and what appeared to be cubes and puree of (Butternut?) squash dressed in a chestnut honey – Awesome! A cool presentation in the cast iron skillet this was wholesomely fresh and delicious. Do Not leave without ordering this. 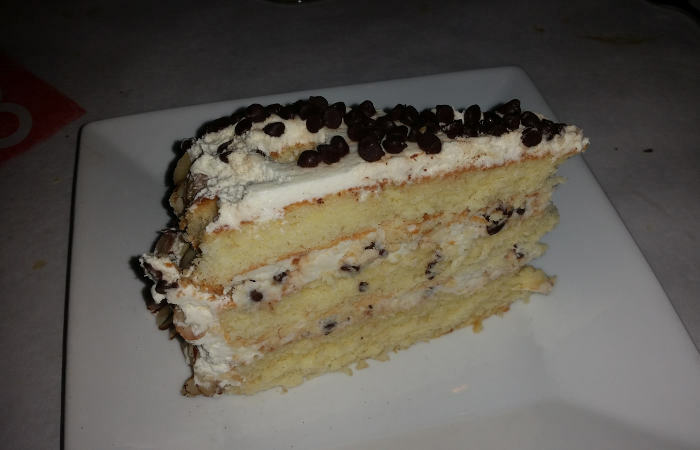 We didn’t order desert but the staff picked up on my not-so-subtle hints regarding my companions special day and brought out a large slice of Casatta Cake with a rather larger torch. While it was a little embarrassing for the birthday girl the cake was excellent and the gesture much appreciated.